Last Friday was the last day of school for 2015 for Kayla. The day before, her home room decided to plan a breakfast party in celebration thereof. So far so good, but then my child (or perhaps this time she was Mark’s child!) volunteered to bring cheese grits for the class. 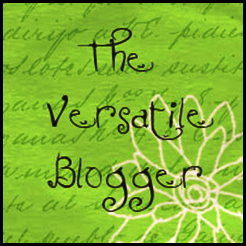 Mark hates Wal-Mart and only goes there as a last resort, but by the time I got home that night, the two of them had already been and returned – with two five-pound flour bag size packages of grits. I think he got off light. When I awoke the next morning, Kayla already had plopped three stock size pots on the stove and filled with them water. She was standing in the kitchen waiting for them to boil. The water in pot one started to boil, and Kayla added about three pounds worth of grits into the pot. Studying the huge batch of grits stirring in pot #1, I suggested that pot 1 was all she would need. The child then emptied another two pounds of grits into pot #2 and began stirring. I again left the room, this time to allow my blood pressure to come down. After too short a period, I am called back in. After a moment’s thought, I found a very large stew pot that she could pour both batches in. 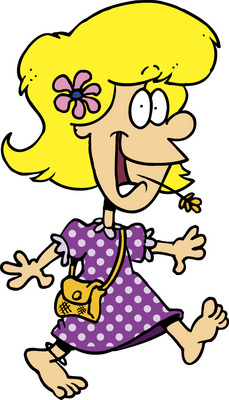 Now all she had to carry was her backpack, slung over her shoulder and the stew pot, which had handles and a lid. She informed me I still needed to go in with her (which involves parking the car in the school parking lot and walking into the school) rather than just take her through the car rider line (which means I get to stay in the car while she gets on out.) A snarling cross-examination established that the only reason I needed to go in was that she was embarrassed to carry in her large pot of grits by herself, which really set me off. At the end of the appointed time, I managed to get the daughter and the grits to the right place at the right time. My parting words to her as I walked from the school back out to the parking lot included a reminder to clean the kitchen as soon as she got home that day. For the record, there still is at least one pot that has not yet been cleaned to my satisfaction. It took all day Friday for my Christmas cheer to return! About three weeks ago, several round white spots, maybe two inches in diameter, and a long smear of white appeared on the kitchen floor. Kayla said she had tried to mop them up, but it hadn’t worked, and neither had vacuuming. I was tired of looking at them by Sunday, so yesterday evening I sat down on the floor and started working on getting those spots up. The spots were made by a thick, hard substance, though, and the only way to remove them was to scrape the substance off with a knife. It was too thin, too uniform and not stretchy enough to be gum but it was too tough to be something like sugar or icing. I let her off on a technicality. FN. We have a glass cook top on our stove, and it requires a special cleaner that rubs on like a paste and then is wiped off with paper towel. Apparently once the stuff dries without being rubbed off, it is impenetrable. I finally have relented and allowed Kayla to join Facebook, with the single stipulation that I MUST approve all friends and follows before she either makes or accepts either. Her first wave of friends includes most of our family (if there’s anyone out there I missed, it’s purely accidental and I apologize!) including my mother. Last night, I went in Kayla’s room to check on her, and she was very proud to tell me she had just been chatting online with my mother (her Grandma Dottie.) Kayla was happy and excited. The conversation led me to think about communications. For millenia, the only means of communication that people possessed was mouth-to-mouth. Coupled with transportation limited to the use of the foot, it took a very long time for messages to get anywhere farther than maybe the next cave over. 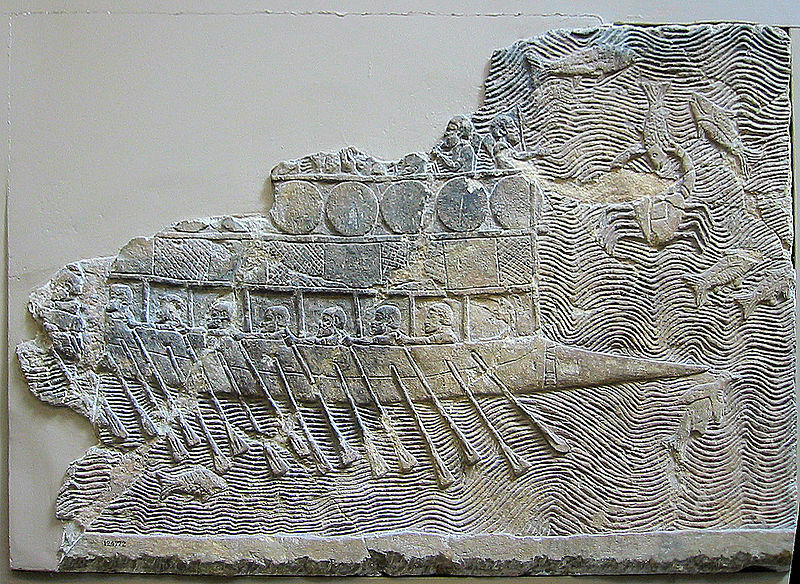 Relief Carving of an Assyrian Battle Ship from around 800 B.C. A few brave souls realized that you could travel to certain places quicker if you went by water. There were unique dangers involved and the range of places you could reach by water were limited, but you could travel farther faster then on foot. One day during those vast uncharted millennia, some enterprising soul evaluated the risks of falling off a horse trying to break it versus the rewards of being able to get a message three villages over in half the time, and the use of the horse for transportation and communication began. Another incredibly brave family apparently very fond of their possessions and wanting to move elsewhere without having to leave any behind decided to take two or four oxen and attach them to a wagon with their stuff in it. Big animal + big horns = big problems, but someone persevered long enough to make it work. Smack dab in the middle of antiquity, the Phoenicians, who were fantastic sailors, decided to invent the alphabet. Before that, the Babylonians had invented a kind of picture language they inscribed on stones, and the Egyptians invented the hieroglyphics they wrote on papyrus and tomb walls, but while the Babylonians and Egyptians wrote primarily for local purposes, the Phoenicians were salesman, the tradesmen of the Mediterranean, and they need something fast, snappy, easy to adapt and relatively easy to learn. So now, messages could be sent directly to someone else in a fairly far away place preserved in writing rather than dependent on memory and transmitted by ox, horse or foot power. The Romans, believing that conquering required an excellent road system, aided this process with a series of excellent roads built throughout Europe and the Middle East. 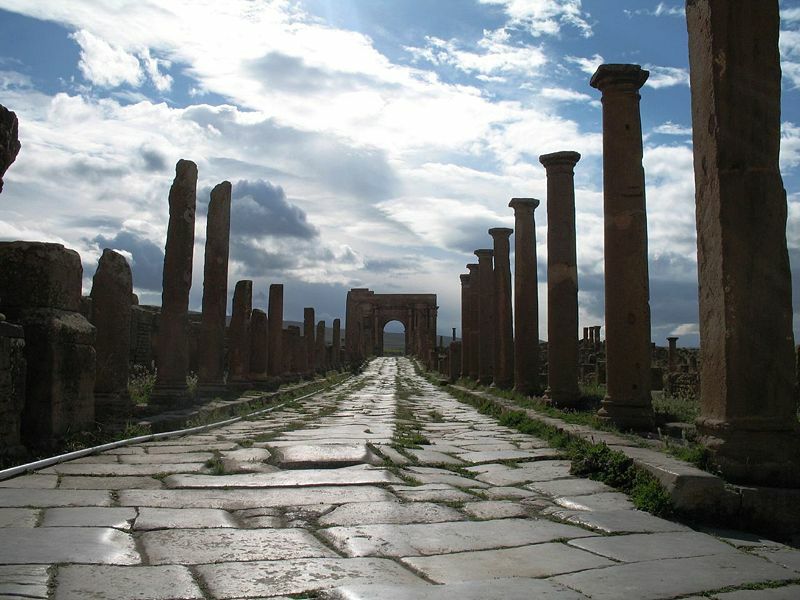 Portions of those roads, some of them built over 2000 years ago, still exist today. Bear in mind that it took the world thousands of years to reach this point. For another couple of millenia, communications’ revolutions were sedate, although people, being people, continued to make better versions of the equipage that animals could pull behind them, the ships that men could sail and the materials used to preserve and transmit messages. 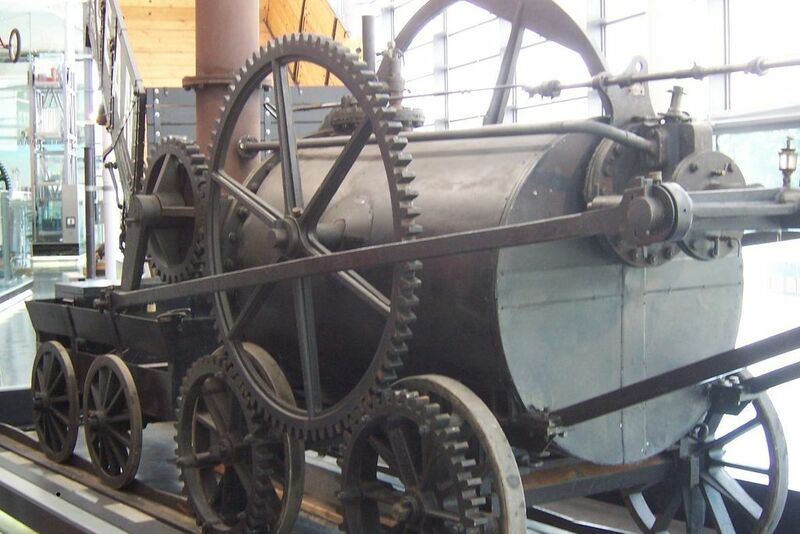 Then, on February 21, 1804, Richard Trevithick’s “puffing devil” steam locomotive made the first train run on a track from point b to point a. It took about a decade for the commercial ramifications of steam engines to come to fruition, but by 1850, there were over 9000 miles of track laid down in the United States, and over 6621 miles laid down in England. In 1837, inventors in England and in the United States invented separate telegraph systems capable of receiving and transmitting messages across wires in mere minutes. Communication possibilities exploded. Until now, the driving force behind communication/transportation innovations was to improve commerce, (although train companies were quick to pick up on the possibilities of passenger service). 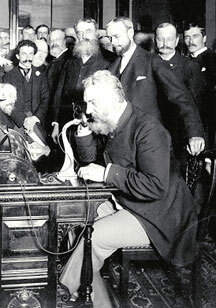 However, communications began its next evolution in 1876 when Alexander Graham Bell invented the first telephone, that is, the first device that was capable of producing a clearly understandable reproduction of a human voice. By the 1900’s, not only had telephones spread throughout the United States, but their main switchboard facilities had begun to become mechanized. As part of the effort to improve telephone service, the first digital networks began to be developed starting in the 1940’s, although it wasn’t until 1978 that Motorola developed and sold the world’s first mobile phone. In the early 1970’s, my family lived overseas in Taiwan for a couple of years. Even then, we could not talk to people back home by telephone very much or for very long, so we would record stuff on cassette tapes and mail them back home to the states. I was very moved when, on my grandfather’s death a couple of years ago, I came across a cassette tape he had kept from that time. 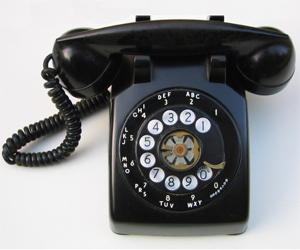 Even when we came back to the states in the mid-1970’s, people had rotary dialing, not touch tone, and the phone stayed attached to the kitchen wall because cordless phones were either not invented yet or at least not inexpensive enough for normal people. Now, of course, we take instant communication for granted. If I can’t remember something I needed at the grocery store, I stop in the middle of the store and call home to find out what the unknown item was. In fact, I get miffed if I can’t reach someone right away. Instead of having to run for the kitchen phone from remote areas of the house when the phone rings, we now get to hunt for the cordless phone all over the house because Kayla and I both seem to be constitutionally incapable of putting the darn thing back in the same place every time. When one of my bosses went to Germany a few weeks ago, he never missed a beat back here at home. The speed at which he could obtain his e-mails was only limited by whether they were coming in at a time of the day when he wanted to read them. Sometimes, (read “almost always” if you are below the age of 25), we don’t even talk on the phone anymore; we text messages back and forth on our cell phones. 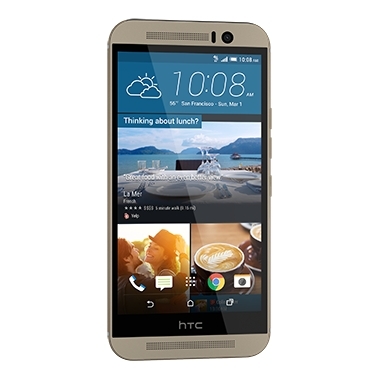 Many younger people are beginning to eschew home phone lines altogether, keeping only mobile phones. I can understand that, but it just seems so unrooted not to have at least one landline connected to your place of residence. We can chat face to face by Skype to people on the other side of the world and receive news from anywhere in minutes through signals bounced up to and down from satellites orbiting the earth. Until the smile on your child’s face after talking to her grandmother lights up your world as well as her’s.